Where the streets are paved with Marble. Heard of the Yellow Brick Road? Introducing the White Marble Road. 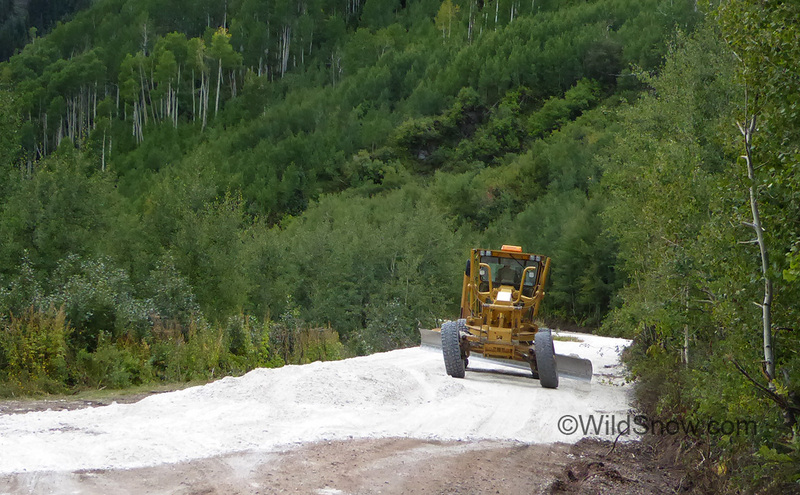 Colorado Stone Quarries (Yule Quarry) rented a crusher this fall to produce road topping from their marble rock scraps. According to workers, while some of the marble becomes a gravel, much of it “explodes” into a sand-like fine. 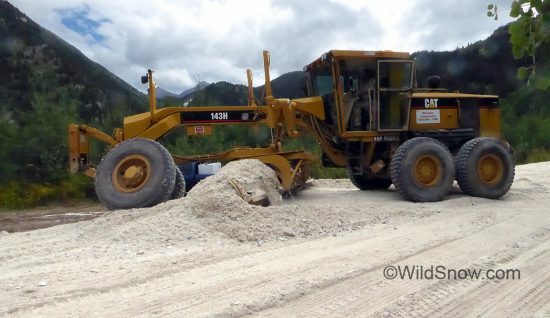 The plan is to grade and compact what appears to be about a 6-inch lift of this mixed gravel and sand material (similar to conventional road base), then “brine” it with a salt solution that reacts with the marble to tighten it up. Interesting! As an alternative to asphalt, clean. We do wonder how the light colored surface will behaving in icing conditions this coming winter. Will it reflect sun and ice less? Or reflect sun and stay icy instead of drying? We’ve had some snow this August. But. This isn’t snow, it is marble! Other improvements: Yule is renewing all the road drainage culverts with beefy lengths of well casing. They’re making new turnouts on the one-lane road, and helping the traihead parking areas. It all looks wonderful. Quarry boss told us the project would be completed by the end of October. They’re attempting to squeeze the work between tourist season and winter, as they may have to occasionally close the road. 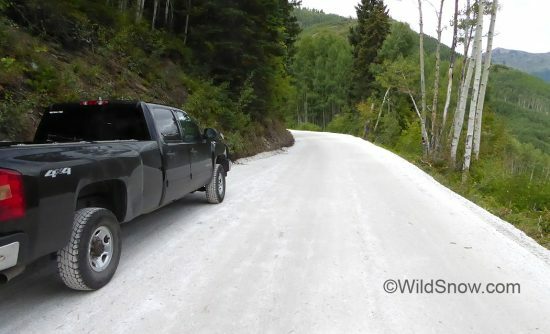 If you’re looking to hunt or hike from the trailheads this fall, know Quarry Road will probably be drivable most of the time since the marble topping compacts quickly. As always, you can phone the Quarry offices for current road information, or stop by in person and get the story. I want to ride my bike on that marble! that stuff was slick as snot today. going to be interesting up there this year. Yikes, how can we decipher ice from marble this winter?